Kids Eczema Treatment for Legs, Knees, Thighs, More! Enhance your kid’s eczema treatment with protective pants that prevent harmful scratching, provide soothing comfort and itch relief and enhance the effectiveness of topical creams. These Remedywear pants are specially designed for children of all ages with a legging-like fit that can be worn alone to sleep or under regular clothes for day time wear. Treating eczema on toddler thighs, legs, and buttocks can be difficult and uncomfortable. Give them the soothing protection they need with a fit, like second skin, that they’ll love. Remedywear's soothing clothing is an essential part of any kid's eczema treatment. Check out the Remedywear's coordinating kid's long sleeve shirt. Remedywear was specially designed to provide soft, comfortable, breathable garments for people of all ages with eczema and other sensitive skin conditions. What makes Remedywear so special? Zinc! Anti-inflammatory zinc is embedded within a soft, stretchy blend of sustainably and responsibly made natural fibers (TENCEL) to create super soothing, super comfortable Remedywear. 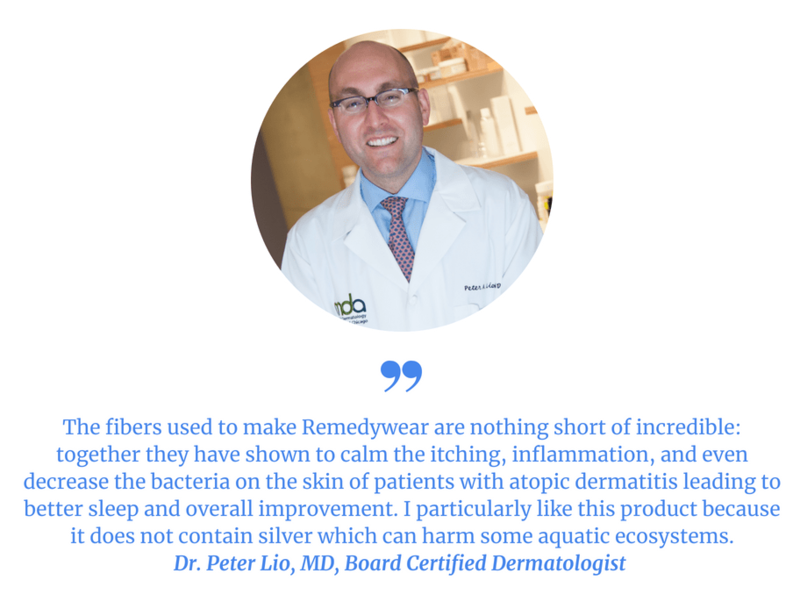 In a clinical study , our ratio of TENCEL and Smartcel™ Sensitive was proven to reduce the severity of atopic dermatitis, reduce itchiness and improve quality of sleep when worn overnight for three consecutive nights. Soft, breathable fabric embedded with anti-inflammatory zinc. Smooth, round fibers inhibit bacterial growth, and reduce odors. Moisture wicking fabric means no sweaty irritation or chafing. Soothing clothing that can be worn day and night. Hypoallergenic fabric and dyes (phenylenediamine free), no irritation. Free of latex, nylon, nickel and formaldehyde. Tags (100% recycled cotton) are easily removed and seams can be worn outside the clothing for desired comfort. Chemical free, Okeo Tex 100 certified fabric. Check out the full line of Remedywear. Our garments offer 35-50+ UV protection! Wear Remedywear to cover your fragile eczema skin when out in the sun and avoid harsh sunblocks that can cause further irritation. Remember to always wear sunscreen to protect any parts of the body not covered by our clothing. Our soft, gentle clothing is not meant for play and should not replace surf/swim clothing meant for more aggressive use. 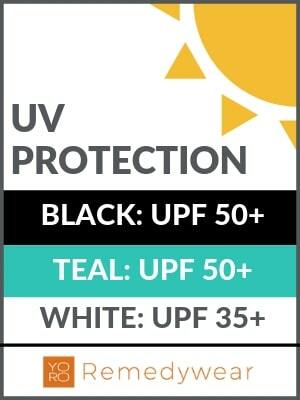 Check the chart below to verify the UV protection offered by the various colors when worn wet or dry. Works well dry! No need for uncomfortable wet wrapping. Wear them over itchy, dry skin alone or for best results over an emollient. For best results wear them overnight or all day under regular clothing. Remedywear is made in Portugal with fair trade, eco-friendly, award-winning production standards. Wash before your first use. Machine wash on a gentle cycle with cold water (<40 degrees C) using a mild plant or mineral based detergent with no bleach or chemical whitening agents. Do not use fabric softeners or conditioners. Do not dry clean. For best performance and to extend the life of the garments, lay flat to dry. You may also dry on a gentle cycle at a low temperature. Iron at a low temperature setting (less than 110°C).